The idea of making up your wedding guest-list may conjure up images of “The Father of the Bride” and conversations about the chipper chicken, but often, this task is no laughing matter. If you’re about to create the guest-list of your dreams, then the best way to tackle this job is to have some guidelines to go by before you start. The following seven tips offer you some helpful guidelines that will make creating your guest-list a bit more manageable. This list will also help you cut down on some of the peace-making you’re going to feel obligated to do once you have to start trimming your list. 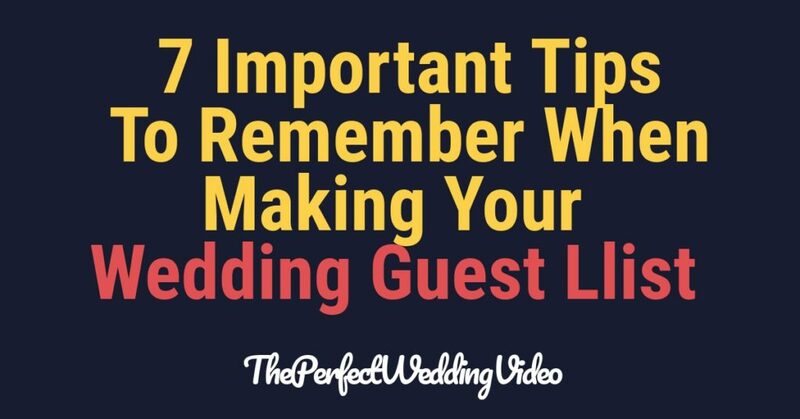 Weeding out your wedding guest list may be a little like inviting Marie Kondo to your wedding: If you’re not sure if a person has brought you joy in recent years, they probably shouldn’t be on your wedding list, and nor should they make an appearance in the video of your day. This isn’t meant to sound harsh. Unless you have an unlimited budget and the venue where you’re getting married spans 40 acres, you cannot invite everyone that you’d like to. Here’s the thing. If you start the process with making a list of the people you know you can’t invite, then your actual list becomes that much shorter and that much less cumbersome to manage. The people that should go on the immediate “no-list” should include family members and friends you haven’t spoken to since the last ice age, casual work friends, and neighbours with whom you only have a chat-over-the-fence-every-once-in-a-while relationship with. Then there is also that one friend or family member that makes a scene no matter where he/ she goes. Unless you’re ready to hire a bouncer for your wedding, it’s best to keep that person off your list. Finally, it really is okay to have an adults-only wedding. Not having kids at your wedding saves you money with the caterer and other per-piece items. This technique isn’t one that you should advertise, because no one wants to know that they’re not on the A-list. However, adopting such a policy can cut down on the headaches that you encounter when making your wedding list. This is how it works. You make two lists, an A-List and a B-List. The people on the A-List are people that you and your intended, plus each set of parents (if they’re involved in the planning), have agreed must be at your wedding. These include best friends, grandma, sisters, cousins, and the deli owner that makes your favourite craft ice cream (or whatever). The B-List are the people in your life that you’re really fond of but never see or who you’re not as close with. To roll this out, you’ll first send all of your invitations to the people on the A-List. You wait for them to RSVP. Some will not be able to make it. If they can’t, then the first invite to the #1 person on your B-List can go out. The key to making this work lies in managing the two lists. The B-List should be numbered, meaning that the first person on your list is the first alternate so to speak. The next person is your next choice. You get the idea. If you’re mostly an introvert, who thinks that the perfect way to spend an afternoon is to hole off by yourself with Harry Potter and a cup of tea, then probably you don’t want to have a huge wedding. Your parents and your intended parents might not like the idea. That said, if you know for sure that you want an intimate wedding with just close family and friends, then that is your wedding style. Your guest list should be formulated with this in mind. This parameter will be helpful once you do start dividing up the guest-list chores. Usually, the guest-list-making duties are split three ways. You and your soon-to-be spouse get half of the list. Each set of parents gets a third of the list. That means if your wedding list is going to be 100 people, hypothetically, then you get to choose 50 people and each set of parents get to choose 25 people. Naturally, if the wedding is smaller, then the numbers will be adjusted to fit your more low-key style. Finally, it’s okay to make it clear to everyone that just because they have say, 20 people they can invited, doesn’t mean they have to invite 20. If they think of fewer people, then that’s okay, too. The least number of complications you’ll have when planning a wedding is to elope. Then next least complicated thing to do is to pay for the wedding yourself. The most complicated thing? Well, that’s when each set of parents offers to pay for some of the wedding. With money comes expectations, no way around it. Handling this feels akin to walking a tightrope, especially when it comes to inviting people to the wedding. Your parents may want people on their list that you don’t. If they’re paying for part of the wedding, then they may feel like they can push the issue. That’s just a fact. If you do not feel like you can live with this eventuality, then you must address your wedding’s finances in another way. Accepting other people’s money to pay for your wedding means they get a say. Are kids going to be invited? The Plus-One you’ve never met? The overseas relative you once spent a week with on a class trip to France? These scenarios add complications to your list-making duties, unless you address them ahead of time. For example, some couples will not allow a Plus-One, unless the person is a spouse, a fiancé, or someone with whom the invitee has been involved with for at least a year. When you’re trying to come up with the rules for all, it’s best to get together as a unit, meaning you and your intended plus each set of parents and decide on the rules together. You can make the list-making easier to manage if you create a common document that all the shareholders can see and can amend. Something as simple as a shared Excel sheet would work. Basically, you create this document in Google Drive and add the list of names to it. As people RSVP, you can put them on a new tab that you’ve colour-coded. No names get taken off the document completely. They just get moved as each person’s status is updated. It’s natural to want to talk about your upcoming wedding with just about anyone who will listen. Unfortunately, this opens up a can of worms. That is to say, it may be natural to tell the person you’re chatting with, “I’d love to see you there” or some other equally inviting-sounding phrase. Avoid this, unless you want a misunderstanding down the road when this person gets left off the guest list.